At DMV.com, we assist you with all of your Washington DC DMV needs. We provide all the details you must know about driver’s licensing, including the steps to obtain a new DMV drivers license, how to renew or update an existing license and how to replace a lost license. All of this information makes your trip to the DMV that much easier. Furthermore, DMV.com features an education center that helps resident drivers sign up for driver’s ed classes, prepare for the written driving exam with practice tests and enroll in traffic school for defensive driving courses. We even offer various convenient DC DMV services online such as online car registration renewal, online driving record orders, online vehicle history report orders and more. For a complete and detailed list of all of the Washington D.C. Department of Motor Vehicles services at your disposal, review the sections provided below. Drivers must get a DC DMV drivers license if they have lived in the district for 30 days or more. Learn about DC drivers license services. Order your Washington DC DMV driving record online today. Requesting driving records online in DC allows you to avoid a wait at the DMV. Auto insurance is required for cars registered with the Washington DC DMV. Find low cost car insurance at our online car insurance center. DC traffic school can help drivers to receive insurance discounts and reduce demerit points. Discover the benefits of online traffic school. Take a Washington DC DMV practice exam to prepare for your written license test. A DC DMV practice test can help you earn your license. 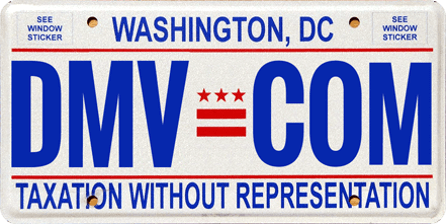 The Washington DC DMV requires vehicle registration for licensed vehicle owners. Learn more about auto registration services in DC. Washington DC drivers education can equip new drivers with safe driving skills. Learn about the benefits of online drivers ed in DC. A DC car bill of sale records a car’s transfer of ownership when you buy or sell a car. Learn how to get a bill of sale from the DC DMV. Washington DC traffic tickets require drivers to respond or face DMV penalties. Discover your options, including how to pay a ticket online. DUI and DWI are taken seriously by the Washington DC DMV. Learn about DC DUI and DWI consequences, including fines and license suspensions. Buy a used car or new car online in Washington DC for a simple car-buying experience. Buying a car online makes DC DMV registration easy. Find Washington DC DMV locations near you. Motorists may need to visit a DC DMV office to obtain DMV services such as getting a new license. You’re only a click away from getting the most up-to-date info regarding the Washington DC DMV. We are a privately owned website, freed from any government liaison and time-consuming bureaucracy. Our chief aim is to make all the required info on the Washington BMV readily available in an easy-to-understand manner. The vast array of articles will break it all down for you, when it comes to the specifics such as car driving/ownership, vehicle registration, auto insurance and much more. Finding info on DMV.com is fast and easy. Finding info on DMV.com is fast and easy. Just use the “search” feature above or the navigation sections and that’s it, the needed info will pop up on your screen. Last but least, we encourage you to comment on our pages, provide us feedback, rate your local offices and speak your mind on what fascinates or bothers you. Join us on Facebook and with your interaction help us get the latest info 24/7.